Walnut, ash, hickory, maple, American cherry. 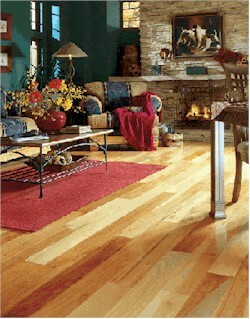 For over half-a-century, Zickgraf has transformed these beautiful hardwoods into some of the world's finest flooring. Combining the artisan's eye for precision craftsmanship with the latest innovations in finishing and manufacturing, Zickgraf is able to produce flooring that is both alluring and enduring. A passion for excellence can be seen in every one of the 45 selections of homegrown and imported hardwoods in the Franklin Collection. These 3/4" thick, solid hardwoods are incomparable in their quality, with a purity of grain and intensity of detail that is virtually impossible to replicate. Floors that represent the peak of perfection when it comes to delivering a level of definition and quality of character today's discriminating homeowner demands. Available in traditional 2-1/4" wide strips, the Franklin Collection floors are also presented in 3-1/4" and 5" wide planks for an even bolder visual statement. While the enduring beauty of 3/4" thick, solid hardwood elegance is what helps give Zickgraf flooring its eye-catching appearance, our proprietary Diamondized finish ensures it stays that way. The crowning touch in a comprehensive multi-step finishing process, the Diamondized finish utilizes a blend of diamond and aluminum-oxide particles suspended in advanced, UV-cured urethane. The result is a high-performance finish that protects the beauty of the wood while providing a satin-smooth, fine-furniture finish that is striking in appearance and unprecedented in durability.